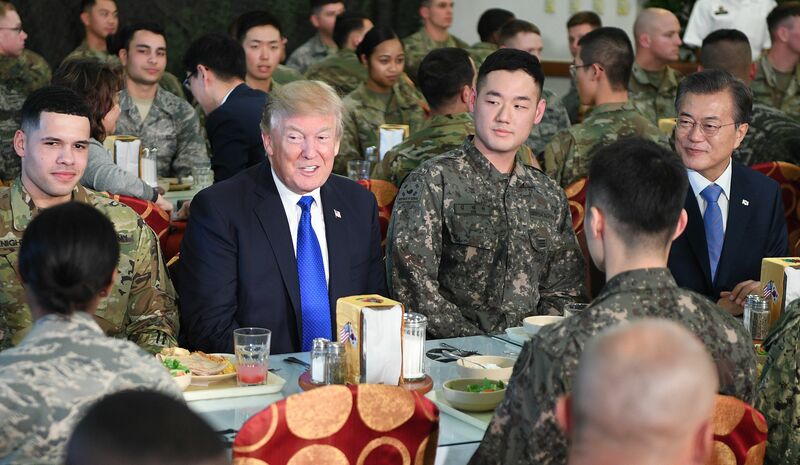 President Donald Trump’s second stop in his Asia trip is in South Korea on Tuesday, where he spoke of America’s trade deficit and ate with soldiers. 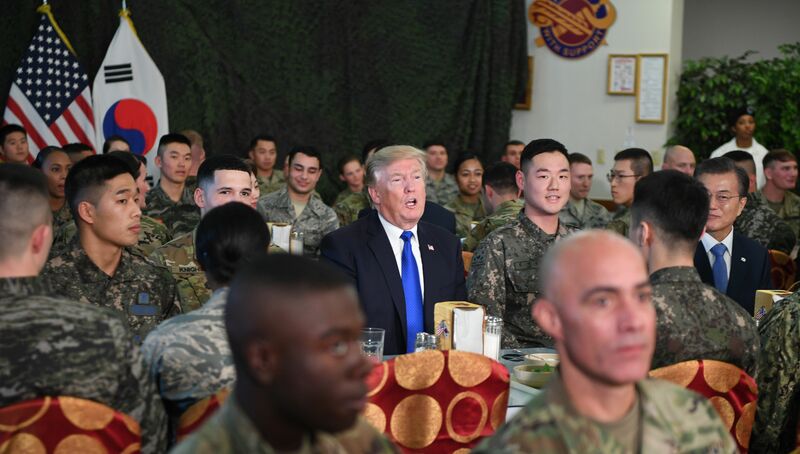 “I had a choice of having a beautiful, very fancy lunch and I said no, I want to eat with the troops and we ate with the troops,” Trump said about his lunch at Camp Humphreys. 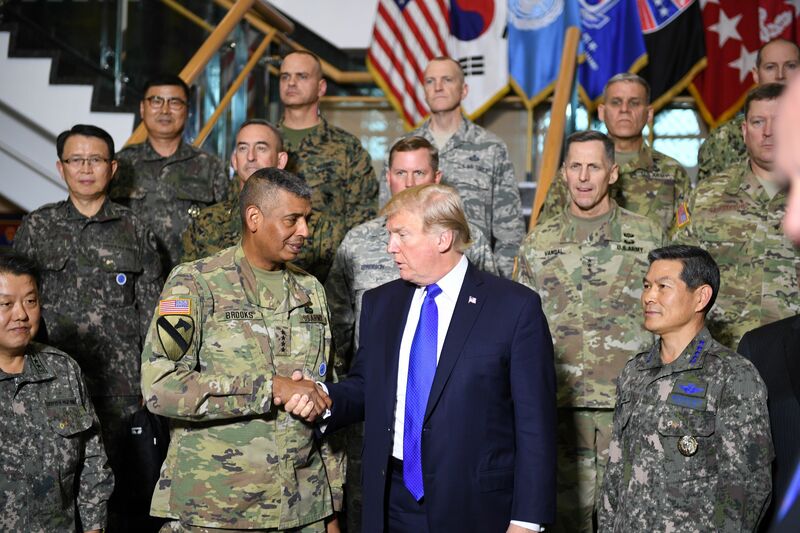 Trump visited the military base instead of the demilitarized zone (DMZ). “It’s becoming a little bit of a cliché, frankly. And that’s why he’s going to be down at Humphreys,” a senior administration official, speaking on the condition of anonymity, told reporters last week. US President Donald Trump (C) talks to military personnel while South Korean President Moon Jae-In (R) looks on at Camp Humphreys in Pyeongtaek, south of Seoul on November 7, 2017. US President Donald Trump (2nd-L) talks to military personnel while South Korean President Moon Jae-In (R) looks on at Camp Humphreys in Pyeongtaek, south of Seoul on November 7, 2017. Trump later had an operational briefing with key military leaders. “I think ultimately it will all work out, it always works out, it has to work out,” Trump said about tensions with North Korea. Shortly after he landed in Japan Saturday, Trump delivered a speech that could only be interpreted as a warning to North Korea’s Kim Jong Un. 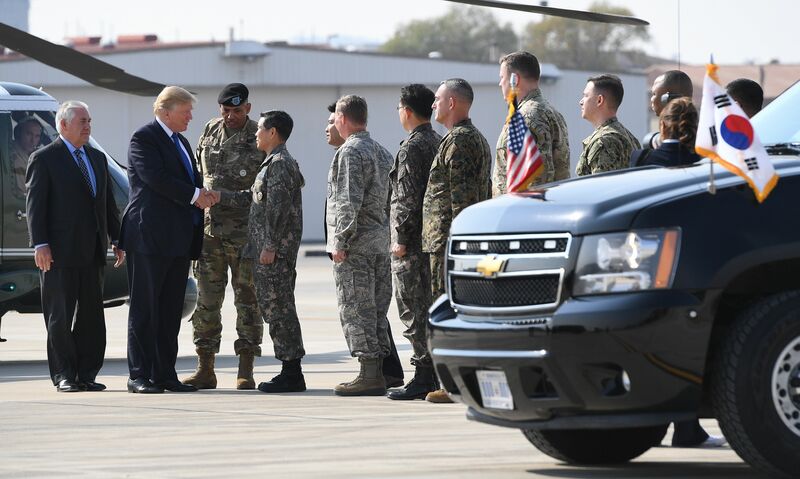 US President Donald Trump (2nd-L) greets military personnel upon arriving at Camp Humphreys in Pyeongtaek, south of Seoul on November 7, 2017. US President Donald Trump shakes hands with US Forces Korea Commander General Vincent Brooks at the 8th Army Operational Command Centre at Camp Humphreys in Pyeongtaek, south of Seoul on November 7, 2017. President Trump also continued to bring up the issue of America’s trade deficits.